Fermented shrimp products are widely used throughout southeast Asia and even, albeit to a lesser degree, in India and China. Indeed, it is almost impossible to imagine Thai, Malay or Indonesian cookery without this unique and interesting ingredient. The variety you see in the first picture is a product of Malaysia, where it is known as ‘Belacan’ (sometimes spelled ‘Belachan’) or ‘Blachang’. In Indonesia, a very similar product is made and, there, it is called ‘terasi’ or ‘trassi’, while in the Philippines, the local variety is most commonly called ‘bagoong’. The Thai product is called ‘kapi’ and in Vietnam there are a variety of names depending on the type of shrimp that are used. As you can see, this Belecan is very basic and contains nothing more than small shrimp and salt. Some dried shrimp pastes are very dark in color, such as the one pictured here, but they can also come a much lighter hue. Others are more of a purplish color but, thus far, I have only encountered this in the ‘wet’ paste that is usually sold in jars. In some sources I have read, the purple hue comes from a pigment in the eyes of certain types of shrimp. 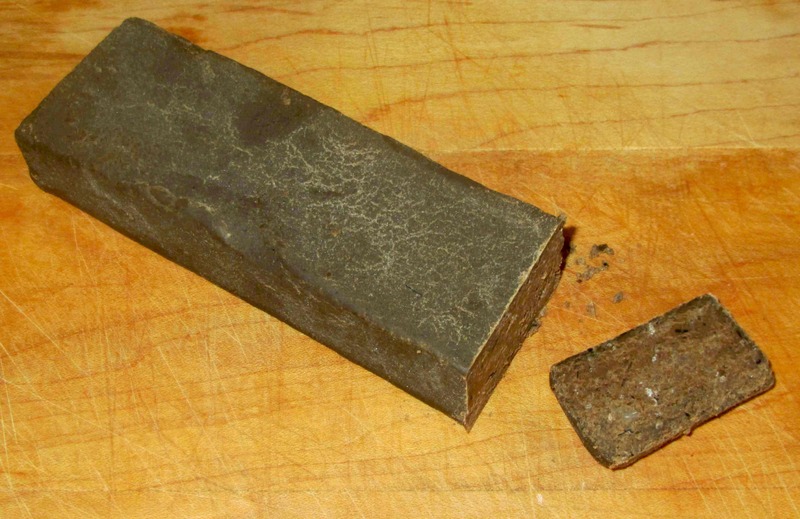 The texture of the dried block is not completely homogenous and, if you look closely, you can see that the cut section has an appearance not unlike a dense meatloaf and that some tiny fragments of shell are visible. The block still has considerable moisture and if you squeeze a piece between your fingers it is quite cohesive and feels rather like a firm, slight resinous and granular dough. The aroma of the raw product is very difficult to describe. Unlike Korean salted shrimp, where the shrimp smell is very apparent, the dried paste has only a hint of ‘shrimpiness’ to it and, in fact, you would be hard-pressed to identify the basic ingredient by the aroma alone. The smell is quite pungent, somewhat sweetish, and has a fermented (read ‘rotten’) fish quality that many people will find offensive. I like the smell of the dried block types myself, but the ‘wet’ jarred pastes are genuinely off-putting and, indeed, have a slight ‘vomit’ undertone that is a little nauseating. Please, though, do not let this scare you away from trying shrimp pastes in your own kitchen… I can assure you that, once cooked, the pungency of the raw product disappears and is nowhere apparent in finished dishes. While still raw, the taste is somewhat reflective of the aroma but nowhere nearly as offensive. 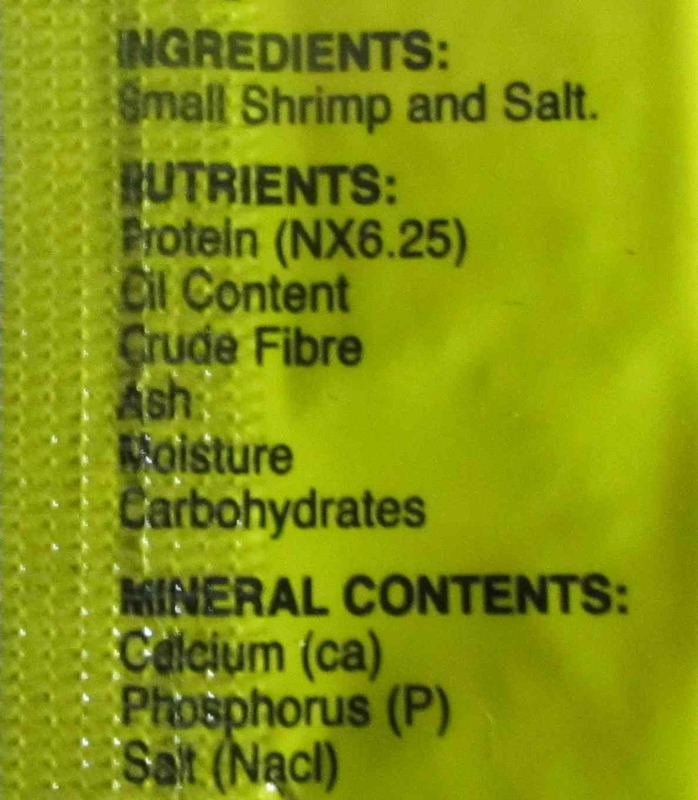 It is still pungent, but it is also a little easier to tell that the product contains shrimp. In cooked preparations, the flavor blends into the background and adds umami depth to things in the same way that a tablespoon of anchovy paste can add a richness to tomato sauce without betraying its marine origin, or the way that Parmesan cheese mixed into a pesto lends an umami taste and not dominate the overall taste. 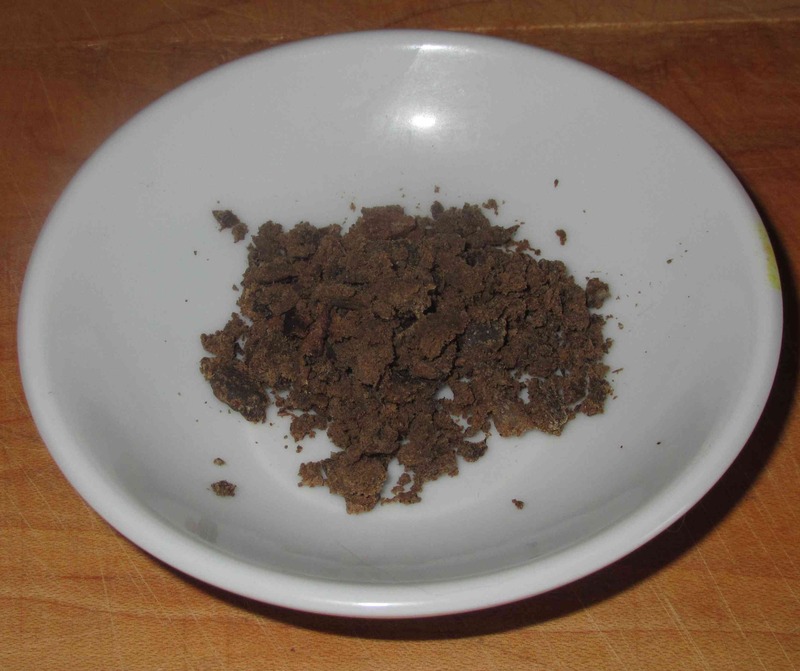 In Southeast Asia, dried shrimp paste is commonly ground with other ingredients to make curry pastes, and is also added as is to soups and stews to enhance them with a lovely umami richness. Occasionally, the product is used cold rather than cooked and, again like curry pastes, it gets blended with chili, garlic, or various spices in order to make dipping sauces or condiments for the table. Two very common pastes used in cookery are the Indonesian Sambal Terasi, and Sambal Belacan from Malaysia. I had rather hoped to do a basic preparation of a simple Sambal using shrimp paste for this post but, unfortunately, I have not seen any fresh red chilies in our local stores for over two weeks now so this will have to wait for the time being. If you are going to use dried shrimp paste yourself it is recommended that you first toast whatever amount you require before adding it to your recipe. This not only has the benefit of really bringing out the flavor, but also will kill any bacteria that may be present. For this reason, toasting the paste is particularly desirable for condiments or dips that are not otherwise cooked. 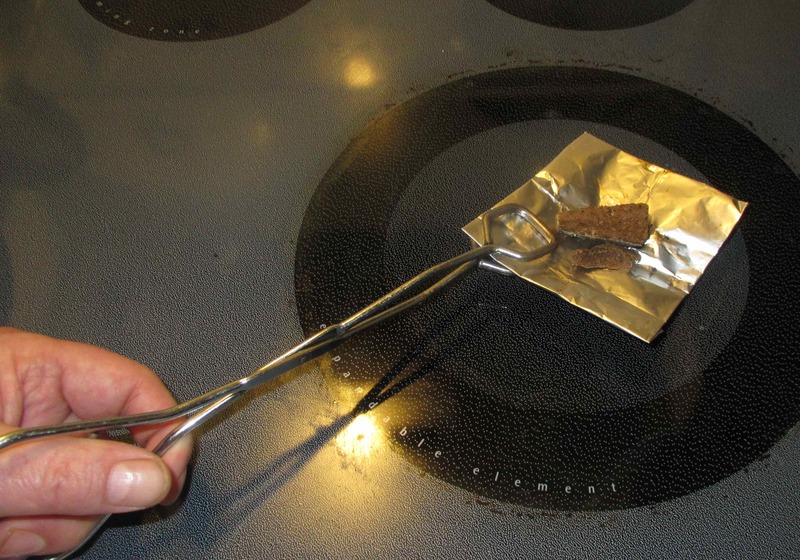 A simple method for toasting dried shrimp paste is to hold it over an open flame or other heat source in folded piece of foil. You should be warned, however, that this will allow the very strong smell of the product to fill your kitchen, and possibly your whole house so, if you are not favorably disposed to the smell, you may want to open your windows and undertake the operation when nobody else is around. Once toasted, the paste loses its moisture and rather ‘gummy’ quality and takes on a somewhat cookie like texture that I easy to crumble and blend with other ingredients. There is no advantage to doing up a large amount ahead as it easy enough to do small amount as needed and the raw product keeps very well. Some sources say that the dried paste doesn’t need refrigeration but, while this may be true, I err on the side of caution and keep mine in the fridge. You certainly must have a very large pantry for all your unusual ingredients. Very informative. There are so many items at the Asian grocery store that I know I’d use if I knew what they were! Thanks for exposing one. Being a Veggie Shrimp Paste doesn’t quite do it for me – but I spy those wonderful spice jars again and that surely does! 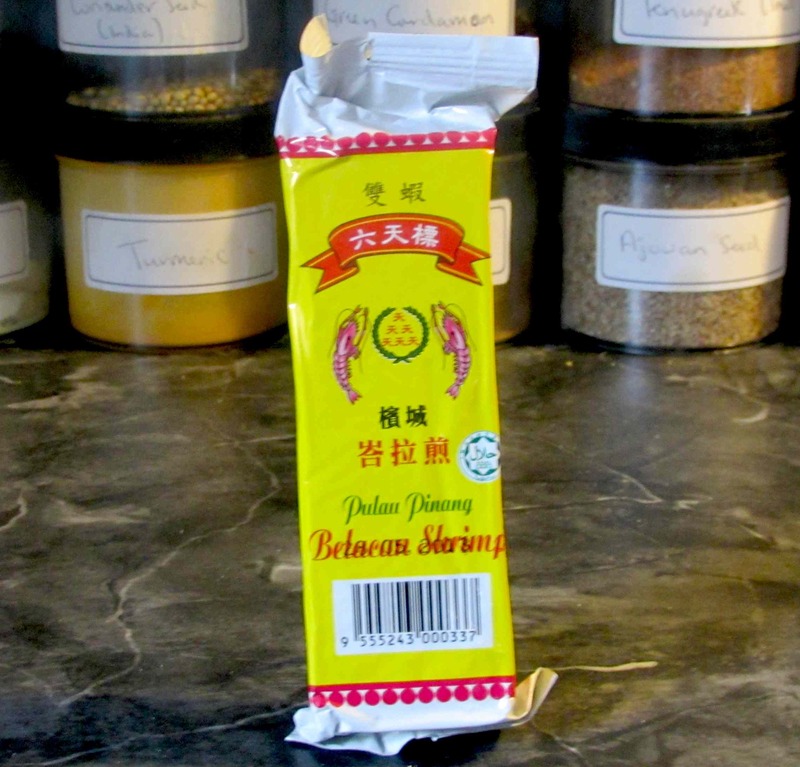 Okay, you have to let me know WHERE YOU CAN GET BELACAN IN CANADA! Especially since you live in Nunavut! I’m Malaysian, and I just moved to Regina a few months ago and I’ve been craving for some sambal for quite a while. Please please let me know! I’ll be eternally grateful! Try the Kowloon Market 712 Somerset St W … there are also several other likely places within a few blocks of this store. Take a look under my Reviews menu and select from the ‘Sources’ sub-menu … Most of the stores listed there (including Kowloon Market) are pretty close together.